The 4th of July is my favorite holiday. It is all about everything that makes summer so special. The day is spent enjoying meals with close friends and family, fireworks, adventures on the water, and just enjoying life in it’s fullest. It doesn’t involve buying anyone a gift or wearing anything fancier than your favorite bathing suit and red, white, and blue pieces. The Fourth of July is a holiday that has always been special to me. I am not a holiday person and very rarely do you see us celebrating many holidays here, but this one is an exception. This year our Fourth will look a little different than the typical day on Lake Michigan watching the fireworks over the harbor. No matter how different, I am convinced that that shouldn’t mean we cannot celebrate my favorite holiday well. 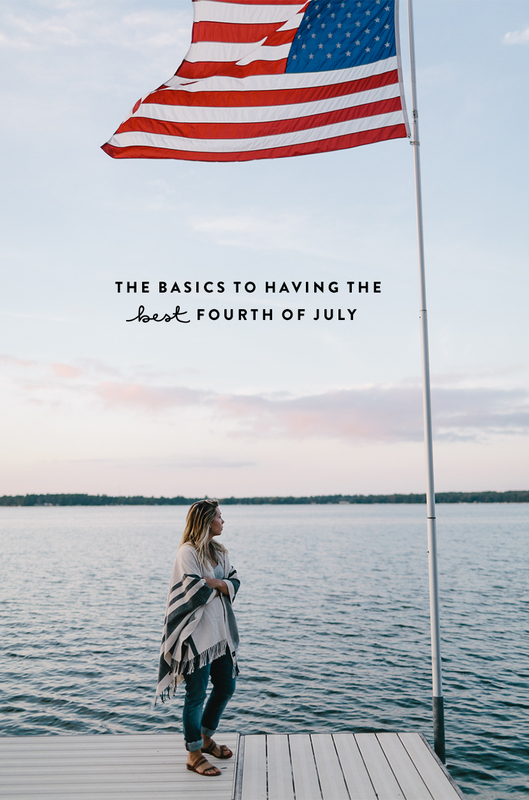 So, I have come up with a few essentials that are the backbone to a great Fourth of July no matter how on or off tradition you find yourself this year! Fourth of July is all about good ole ‘Merica grillin’. Stoke up the charcoal and device a menu that involves all the classics and also celebrates the summer season. You better have watermelon, burgers, and maybe replace the store bought buns with some from your local bakery. Buying local is a great way to celebrate and remember how wonderful it is that we live in a place where so many can define their success. Whether you find yourself stuck for the weekend in NYC, in a cornfield, or by the ocean find a way to make the water a part of your day. You may find yourself grabbing squirt guns, a $10 plastic kiddie pool, or being able to enjoy the ocean or lake herself. Whatever it means make it happen. It will mean for a cooler Fourth guaranteed. The Fourth is a great time of year to finally get all of your friends together. Make a point to gather everyone whether it is for the afternoon or for a meal gathered under bistro lights before heading to the fireworks. Summer gets busy so take advantage of this day of purposeful celebration to gather. Sure it is corny, but who says you cannot wear that cute denim shift dress with a red bandana and still call it patriotic? You don’t have to wear stripes to celebrate. I wrote a post last year on being patriotic without looking too much like a firework in case you need some inspiration. Growing up, my favorite part of the Fourth was not necessarily the fireworks, but waiting for them. We would eat dessert as we held our spot on the bluff overlooking the harbor waiting for the first one to shoot up once it was fully dark. It always felt magical, and that magic doesn’t have to fade. Even last year at the age of 27 it still felt magical. Though this time, it ended with a massive dance party and karaoke session with cocktails being poured and Born in the USA blaring. There are moments we can still find as adults that keep us childlike and in awe and I think this is one of them. Don’t miss the opportunity. I wish all of you the best Fourth of July for those of you in the US. Those of you that aren’t I hope these little tips will still mean you have a wonderful weekend! Now go listen to some Kid Rock and don’t feel embarrassed. See you Monday friends! Also if you need a good Fourth of July playlist, my friend, Will Defries created a great one with all the classics!